Frugal is such an ugly word and it sounds so cheap! I prefer the word savvy. Here is a list of five places to save money in the Valley. In no particular order, I bring you Courtney’s fave five! “I think life is about making reasons to do things!” Stormy the other half of Rocket Resale said, taking the words right out of my mouth. 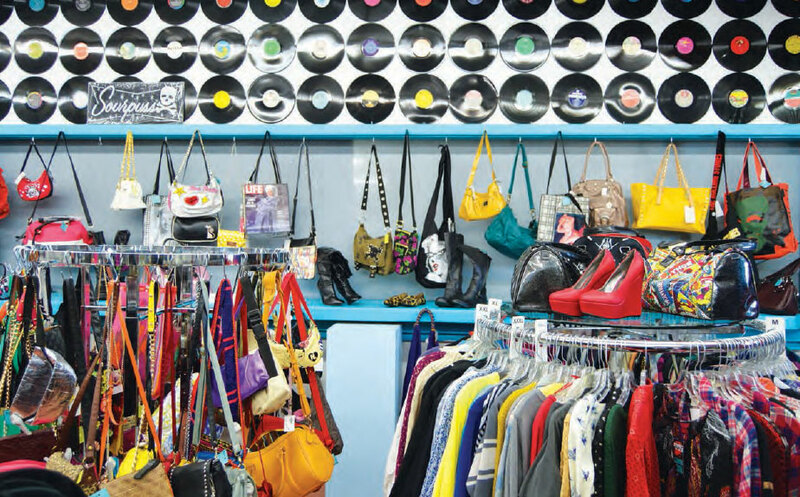 When you walk into Rocket Resale, you feel like you just stumbled in and found yourself lost in a time capsule with The All American Rejects and Run DMC. This place is for the bizarre at heart. Rocket Resale started with yard sales, mini vans and first Fridays. Not only does Rocket Resale buy, sell and trade, they are also home to the work of 26 local artists. You can catch some of their work on display in the store at any given time. What impressed me the most about this store was their ability to cater to the masses. They offer sizes anywhere from 0-3x for both sexes, which includes their all-American made clothing line, Rocket Rebel. In the world of fashion, that is unapologetically unheard. But wait there’s more! Not only do they sell clothes, they have an outstanding selection of hand-crafted jewelry with pieces starting at $4.00 — that’s less than your Venti blah blah blah at Starbucks every morning! Rocket Resale is where it’s at, whether you’re looking for rockabilly pin up or Vera Wang closed toe metallic pumps, or just looking for that special accessory to make your outfit pop. This charm in the desert even has a husband or boyfriend hangout section — need I say more? Oh but I must! The Secret Village has to be one of Arizona’s best-kept secrets, hands down. Sure, prices vary, but you’re not going to find reusable red cocktail cups for $9.99 anywhere; I looked. They have so much to offer at this unique little spot that I can only focus my attention on one block of this amazing village. With that, I give you The Pet Corner, which is a must even if you don’t visit for anything else. This quaint little spot offers everything you need to spoil your pet because, as the saying goes, pets really are like children dressed in fur. At The Pet Corner you will find doggy treats at two for $1.95 and doggy donuts (yes that’s a thing). If you are celebrating your beloved pet’s birthday, make sure to pick up a doggy BDay Bone topped with sprinkles for $9.99! Going somewhere fancy and tired of the average walk in the park? Then fetch a three-piece tie and collar set that your pooch would love for only $5.39. As important as hydration is in the desert it’s even more so for your thirsty pets, so pick up a doggy bowl for $1.99 or better yet a 3 piece doggy bowl set for $7.99. This place is for animal lovers and their adorable pets. If you’re looking for an exclusive shopping adventure, get lost at The Pet Corner where I’m pretty sure all dogs go to heaven. Who said antique was a boring word? Zola Bell’s is everything antique on a silver platter. Bonnie, the owner, was not only welcoming but boy did she have some stories to tell. I felt like I could sit and talk to Bonnie for hours. She describes her store as, “The most fun allowed in one place at one time.” I couldn’t agree with her more. With 16 different dealers and 20% off sales on what I call the vintage alphabet, you can find everything from every era from A to Z. I have never been so many places at one time without technically leaving the building. 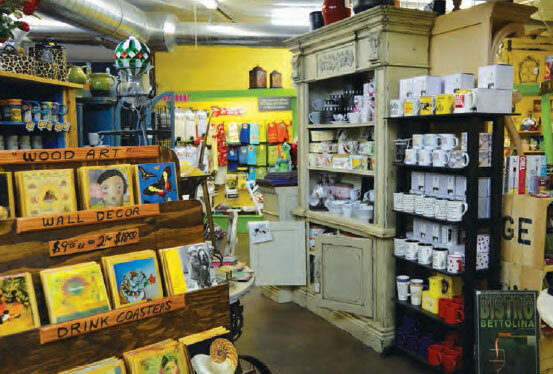 It’s unbelievable that Zola Bell’s has only been here for six years and effortlessly combines Egyptian figurines, Charlie Chaplin trinkets and Star Wars memorabilia all under one roof. They also have an array of vintage records ranging from the Beach Boys, Johnny Cash to Duke Ellington. If you’re an old-fashioned candy lover, they sell vintage candy including Lucky Lights and Charro. You can even enjoy getting your fortune read by Zoltan. Are you a book lover looking for a means of escape? Or do you know someone who appreciates a good book in an era where everything is literally at your fingertips? Lawn Gnome Bookstore is a breath of fresh air for those who still believe in bookmarks. Lawn Gnome is exactly what it sounds like, an actual house with a porch and a lawn in the heart of downtown Phoenix with a variety of books from poetry, fiction and sci-fi to mystery and romance. Prices for hardbacks are as low as six dollars and paperbacks can be picked up for just a buck. You will be pleasantly surprised that all of the prices for the books are written by hand on the first page. I know I certainly was when I went to pay for a book, and it rang up for $0.25. I asked the cashier if the price was right! Apparently all of the books on the porch are just a quarter a piece. Lawn Gnome is like the coolest library to ever exist, except the purchase prices are cheaper than any late fees would be.